While attending a Mov Nat workshop last Spring, I saw the instructor Kellen Milad do a muscle-up. It wasn't part of the official Mov Nat instruction, it was just something he casually did when no one seemed to be looking. I noticed, however, and asked him how long it took him to learn the move. His response was "a while!" Looking at Kellen, it would seem as though he was born with the ability to do muscle ups, flags, and backflips. He has that type of "heroic" physique that screams "good genetics!" So, to hear that it took him "a while" to learn the muscle up flipped a switch in my mind. Kellen hanging out...sideways...off of a pole. For those of you you aren't familiar with a muscle up, it's essentially a combination of a pull-up and a dip. The movement is done explosively so that both motions are seamless but it's the transition between the two that is the real crux of the problem. Many people can do pull-ups. Many people can do dips. Not many people can do muscle ups. I was one of the people who could do pull-ups and dips, but after talking to Kellen, I became determined to learn the muscle up. Once I decided that I was going to figure out how to do a muscle up, I went on YouTube to see if I could find some tutorials. I found hundred of videos demonstrating how to do a muscle up, but 99% of them were completely unhelpful. The individuals in the videos had clearly mastered the muscle up quite some time ago and, while their own progress was impressive, it didn't do me a bit of good since I was nowhere near as strong as they were. Fortunately, even though 99% of the videos were unhelpful, 1% was extremely helpful. I had stumbled upon Global Bodyweight Training's channel and it was the first one to show an actual progression that I could use. I finally felt like I had the tools I needed, so it was time for me to get to work. Prep Work - Pull-ups and Dips - I could do at least 10 really strict pull ups and about 20 strict dips, so I didn't worry about doing more. 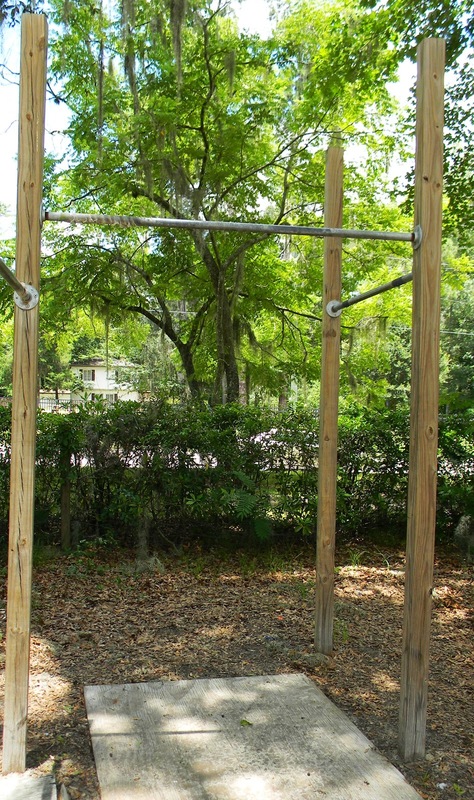 It was clear that the muscle up required a lot of strength and explosiveness, so building endurance (by doing more pull-ups and dips) would have been a waste of time. Instead, I focused on doing pull-ups and dips with a weight vest that allowed me to work with 5-25lbs of additional resistance and also learned how to do the kipping pull-up (shown in Global Bodyweight Training's video). To get the "feel" for the movement (ie. training my nervous system to start develop the specific firing pattern of the muscle up) I began with "assisted" muscle ups. Using a low bar, I utilized my legs to guide my upper body through the muscle up pattern. This showed me how important hand position is and that using a "false grip", one where your wrists are bent, putting your hands "above" the bar is essential. Without the false grip, you won't rotate over the bar as you do your kipping pull-up and won't end up in a position to press up from the dip. Moving up to a higher bar, but one that was still low enough for me to jump up to, I began working on the "jumping" muscle up. First, I just focused on getting my chest to the bar. I stood about a foot or so away from the bar and used my arms to guide the movement as I jumped into position. Gradually, I began moving my feet closer to the bar and increased the amount of extension through my shoulders and back. This gave me a way to develop a feeling for the pre-stretch. This initial stretch is like pulling back on a rubber band and is what actually allows you to do a full muscle up. This step was simply a continuation of the previous step, but using an even higher bar. Doing this forced me to use the pre-stretch phase exclusively because I couldn't just jump up to the bar even if I wanted to. It took me several weeks just to get consistent doing this progression, but as I went along, I started to feel like I could do a full muscle up. The final step, a full muscle up, happened one day while I was working on the partial muscle up progression. I did a partial muscle up to get over the bar, and as I let myself down, swung forward and immediately swung myself back up into a full muscle up. It was a pretty amazing feeling to finally get this as it had taken me a couple months of dedicated training to get to this point. The feeling didn't last forever, since doing something once is very different than doing something consistently. Since doing that first muscle up, I have had to go back and work the previous progressions numerous times. It took an additional month or so of training to be able to now do a muscle up consistently and It is now my goal to do consecutive repetitions (currently at 2-3 depending on the day) by continuing to develop strength, power, and refinement in my technique. For training a complex movement pattern such as the muscle up, I believe that frequent training is most effective. I found that working on my muscle ups at least 3 days a week (with rest days in between) was most effective. Part of this, however, was consciously avoiding muscle failure and maintaining a commitment to doing only quality repetitions. As soon as my form became sloppy, it was time for me to either work on an easier progression or to call it quits for the day. This not only helped avoid injuries, but it also "taught" my nervous system proper form. As I increased the frequency of my training, I found that the calluses on my hands started to tear off (sometimes called a "flapper"). Aside from the pain of exposing the nerve endings and blood vessels on my hands, each time this happened meant at least a week of missed training. Tired of this, I went to Wal-Mart and bought a $10 pair of finger-less bicycle gloves. They worked like a charm and without them, I don't know if I would have been successful in my goal. Check out my video "How to Muscle Up - A Step by Step Progression" to see the process in action! Kellen is seriously awesome. I attended a MovNat seminar with him here in Chicago this summer. Thanks for this article. The muscle up is on my 2013 to achieve list. Currently working on getting my handstand down. My question is : that period where you train for the muscle up, how do you keep up the rest of your capacities ? I'm currently trying to learn this damn move -.- and it has been taking way too long, with on and offs, I finally want to get this muscle up done. I can do a "half muscle up" (?) where I can do it with one hand, but not synced with both. If I do what you suggest, wont this lay back chest / core / shoulder / etc... training? Any way you could reassure my stubborn mind? Thank you for coming to my site, I'm glad you like the guide! I recommend that you prioritize your training around accomplishing the muscle up. Three days a week you should be practicing the muscle up progressions giving yourself one full day of rest in between workouts. Your goal isn't to do a "full" muscle up, focus on trying to increase the number of repetitions that you can perform smoothly with each of the progressions, moving up from one level to the next when you can do three sets of ten repetitions. I dont understand what you mean by pre-stretch? What does it mean? Avigdor, watch the video and see what the motion looks like prior to attempting the muscle up. There is a "swing out" before the attempt to "swing up". This stretches the lats, shoulders, and other muscles and signals a reflexive contraction. This "pre-stretch" is really just the "stretch reflex" (it's what doctors test when they tap your knee with a rubber mallet during a check up). It is a nervous system reflex that you can use to your advantage when performing a muscle up. This is a great video, it touches exactly on what beginners need. I understand what you mean about 99 pct of youtube videos not being helpful ( here is a muscleup! Your turn!). Ill be doing more of the progression workouts. I was excited a few weeks ago when I started getting over the bar, but I have a terrible tendency of throwing my left arm up first as I get more fatigued. I think my left arm is probably alot stronger than my right... and that cant be good. I suppose expertise does come with the mastery of the basics, and perfect practice makes perfect. Anon, glad you like the video and progressions! Unless you are a genetic freak (which I'm guessing you're like me and you're not!) progressions are the key to eventually getting the muscle up. My one suggestion is something I mentioned in the blog post not about fatigue. If you're noticing that you are throwing your left arm over first, try to find a lower bar that allows you to keep the movement very even from left to right. Having a bias towards one arm is something you definitely want to nip in the bud as it will carryover indefinitely if you allow it to become a part of your muscle up technique. I had taken some time off from training recently and when I went back to doing muscle ups, I noticed I was throwing my right arm over first. I had to go back to some of the easier progressions myself! Good luck with your training and let me know if you have any questions along the way! I am so glad I found your page. The internet is littered with these tutorials, but yours is the only comprehensive one for beginners that I found really helpful. I am really excited to start this regimen and had a couple questions. When you started this program, what was your routine comprised of? I am assuming the "Prep Work" component was not a part of this training, since you already had the pullup/dips downpact? And is the "J" pull up also considered prep? I just want an idea of what you did in the 3 days every week. So you would practise progressions 1 to 3 doing quality repititions only? Glad you found this helpful! Given that I was a muscle-up "wannabe" for years and, after following this progression for 3 months achieved my first muscle up, I can literally guarantee that you WILL be successful if you train diligently. My training days started with warming up with the easiest progression possible, assisted muscle ups on a low bar, jumping muscle ups and partial muscle ups on a low bar to medium height bar. For the first few weeks this is as much as I would do, maybe finishing with a few sets of J pull-ups and then some regular pull ups. The only thing that changed as the weeks progressed was the height of the bar on the partial muscle ups. I also started to add some weighted pull ups (either with a weight vest or holding a dumbbell with my feet) about once a week to develop more strength/power. After you feel comfortable with the partial muscle ups, maybe a couple weeks into training, I would start attempting a full muscle up. I say "attempting" because chances are, you won't get it at first (unless you're super lucky and you do!) This is by nature a frustrating experience, so I would go into these attempts with the spirit of adventure, you're just testing the waters so to speak. After a failed attempt or two, go right back into the partial muscle up, progressions to dial your form back in because you might be tempted to "cheat" your way into the full muscle up and this will teach your body bad form and technique! I really appreciate you taking the time to breakdown your workout regimen. I am inspired by your progress and I hope to eventually achieve this goal. Your guide has also made me realize the importance of the 'false grip.' I NOW understand how crucial this is in being able to perform this move, and why I have failed so miserably in the past. Previously, I had been wringing and hurting my joints/elbows trying to complete the rotation with a normal grip... obviously a big mistake. Since I am new to this 'false grip' techinique, I wanted to know is it hard to adjust to this grip after spending many years doing the normal grip? Did it take you time to get accustomed to the 'false grip', or was it something you picked up easily? I guess from now onward all my pull up training should be done with this false grip, correct? Lastly, I just wanted to confirm one subtle thing I noticed. When you transition from the pull-up to the press up does your grip change? So when you performed the muscle up in the video your hands went form the 'false grip' to a normal grip (thumbs under the bar) when completing the dip. Is that true? As you get stronger, you can explosively pull through the transition and do a "quick change" from wrists under the bar to wrists over the bar. Initially however, you probably will need to practice with a full or partial false grip. Gymnastics rings are a great way to train the false grip, just doing dead hangs or pull-ups in this position helps. It's certainly uncomfortable at first, but becomes more tolerable with training.